So here we are, back to you, back to love, back to do what I do best! I have a lot to share in the next coming posts, so let’s roll. First of all, I had to post about this fantastic show coming up on February 17th happening in my hometown away from home, New York City. 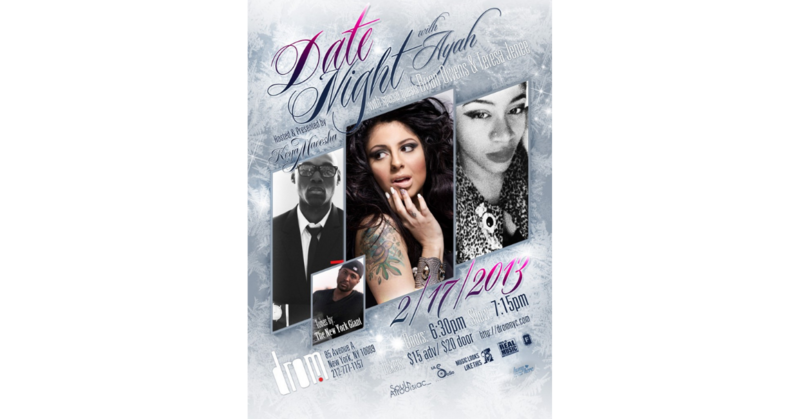 My girl Keya Maeesha is producing her second installment of Date Night, after her first show with Monica Blaire was such a success. And again, I am very proud to be a sponsor for the event. This time around, she’s bringing Toronto’s own (and DJ Jazzy Jeff protégé) Ayah as the headliner, along with Brian Owens and Teresa Jenee whom both hail from St. Louis. Everyone’s individual musical blueprint will leave an imprint on your soul that you will carry away with you way after the vibes are over. Are you ready to let yourself go and immerse yourself into the soiree? If you missed the first show, we can let that go. But the second show? You know you want to add that to your calendar ASAP. So, where will you be on Sunday, February 17th at 7:15 pm? Check out Ticketfly for tickets and more information about the show.